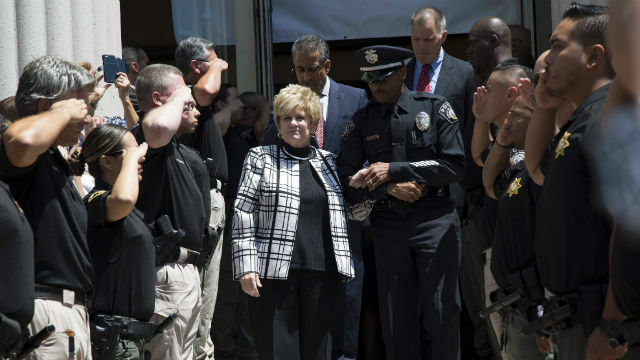 Former District Attorney Bonnie Dumanis announced endorsements Wednesday from 10 law-enforcement associations in her bid for a seat on the county Board of Supervisors. The Deputy Sheriffs Association, San Diego Police Officers Association and the San Diego Police Chiefs and Sheriffs Association were among those endorsing her bid to replace Ron Roberts, who is leaving office due to term limits. The Republican Dumanis also has the endorsement of Mayor Kevin Faulconer and Roberts. Dumanis is running against Republican businesswoman Marcia Nordstrom, and four Democrats — former Assembly Speaker Lori Saldana, attorney Omar Passons, former deputy fire chief Ken Malbrough and former Assemblyman Nathan Fletcher. Although District 4 has nearly twice as many registered Democrats than Republicans, Roberts, a Republican, has represented the area on the board since 1994. Dumanis was the first openly gay district attorney in the country. After her 2002 election, she was re-elected three times, running unopposed in 2006 and 2010 and prevailing in the 2014 primary. Other groups that endorsed her Wednesday were the Deputy District Attorneys Association, District Attorney Investigators Association, Fraternal Order of Police, Lodge No. 10, National Latino Peace Officers Association, Chula Vista Police Officers Association, San Diego Community College District Police Officers Association and San Diego Community College Police Officers Association.